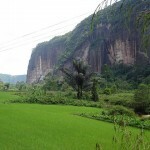 Banda Aceh is the capital of Aceh on the Island of Sumatra. 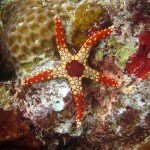 In the last years became famous for the devastating work of the Tsunami in 2004. 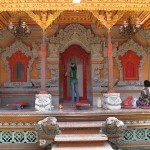 First was called the “City of the King” (Kutaraja). One of the most famous tourist attractions of the city is the Tsunami Museum, built as a memorial of this natural disaster, but today we would like to present you other 6 famous tourist attractions in Banda Aceh, which include the Baiturrahman Grand Mosque, the Gunongan, the Dutch Kerkhoff Poucut Cemetery, the old Aceh Museum, the famous coffee and the annual festivals of Aceh. 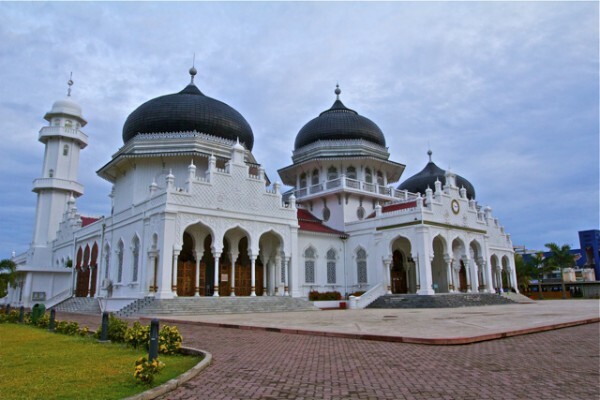 The Baiturrahman Grand Mosque is one of the most important tourist attractions of Banda Aceh and it can be found in the center of the city. The building dates from the twelfth century when the Sultan of the city was Iskandar Muda. 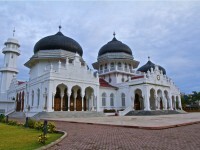 It was destroyed during the Aceh war, therefore it was rebuilt in the second half of the 19th century. The Baiturrahman Mosque is a masterpiece of Islamic architecture and decorative arts, it is one of thoset hings that Banda Aceh can really be proud of. It has five onion shaped domes and two minarets, and wide, thick white walls and columns that are beautifully decorated. In the mosque can fit 9000 people. The Kerkhoff Poucut is the cemetery of the Dutch military and you can find it in the center of the town close to the Tsunami Museum. 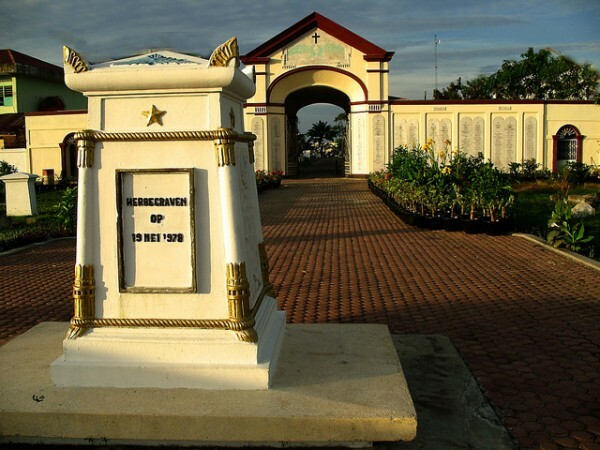 The name of this military burial place came from two separate words, a Dutch and an Acehnese one. Kerkhof means churchyard of graveyard in Dutch and Poucut means prince in the language of the locals. The cemetery is very large, it has more than two thousand soldier graves. It is the largest Dutch cemetery outside of the borders of the country. The 100 years old museum of Aceh is the oldest of all the museums in Indonesia and it is one of the most famous tourist attractions. Houses a large amount of diverse artifacts from the history and cultural life of the region. Today the museum is the property of the government and it is located in Jl Sultan Alaiddin Mahmudsyah. 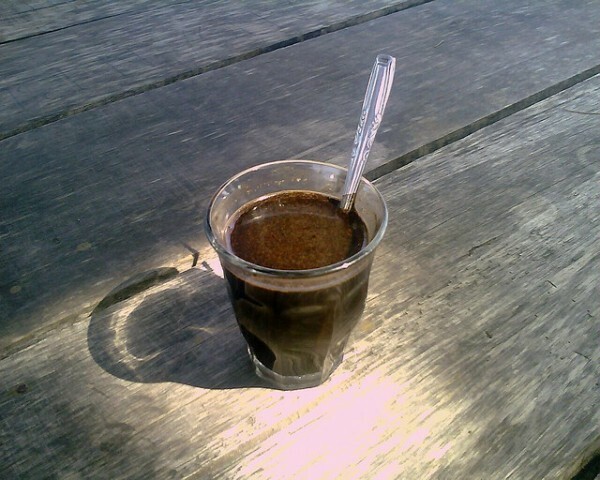 If you visit Banda Aceh you must not miss the famous coffee of the city. You can choose from two types of specially brewed coffees, the Ulèë Karéng and Beurawé coffee from the local coffee shop. You might wonder why we included this in the list of the most famous tourist attractions in Banda Aceh, but if you taste it, you will surely agree with us. If you consider visiting Aceh Batang you might be interested in the festivals held there. The most important festivals in Aceh are the Banda Aceh Festival, Festival Krueng Aceh Peunayong, Festival Geulayang Tunang (kite festival), Festival Kupi and the Indonesia City Expo.